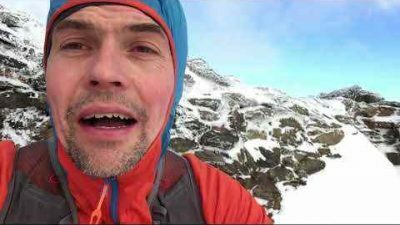 With snow dusting the tops its time to give you idea's on what you should wear and what you need to carry to stay safe in the mountains throughout the winter months. 3rd Layer; Either a windproof outer or hopefully your 2nd layer has some windproof properties. 2nd Layer; Shorts or tights, the eternal question for some. Shorts for benign conditions, but most will prefer tights for all conditions in Winter. You might want to possess several pairs, some lighter ones for less cold and warmer thicker ones for when its really foul. Gore Wind-stopper tights are also available. 3rd Layer; Windproof pants, can be Polatec Alpha, Primaloft or Driclime lined for extra insulation. 4th Layer; Waterproof pants. Our preference is the OMM Kamleika Pant, mainly because they are stretch, meaning full comfort and freedom of movement, they also happen to be very breathable as well and have Dynema kick guards for when you don crampons or micro-spikes. Feet - A sock combination works best here; Liner socks and Goretex socks, Liner socks and Neoprene socks, Sealskins (not our favourite as they don't seem to last very long and don't fit my feet well). If its not so wet on the ground then just a winter weight sock works really well. [you might need to take your insoles out or buy a half a size bigger shoe for winter use. Shoes/Footwear; This is a massive subject, what do you wear on your feet? 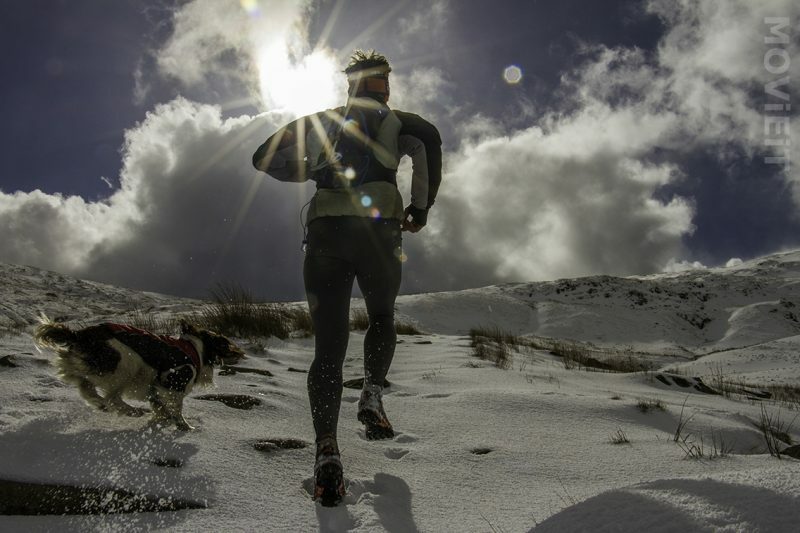 We favour Inov-8 footwear, we believe because it is designed for the UK mountains especially, like the X-Talon 225 or the Mudclaw's etc, then these shoes are really the best for running in the Lakes. However, shoes fit feet and feet are different [massively] so what you must do is find the brand that works for you and choose the deepest lug, best sole pattern for the conditions you run in. 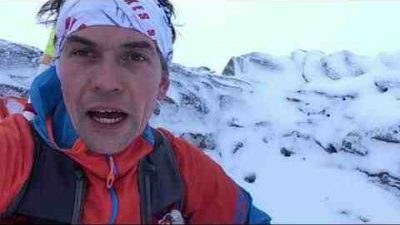 If the conditions are going to be icy and hard-packed where you are running then you might want to think about the Inov8 Oroc's or other winter models. That covers what you might well be wearing, but remember the above is 'conditions dependant' so you might not go out with all this on, but its likely you won't. If we take Monday this week (27th November 2017) for example, then the conditions in the valleys were ok, windy and cold, with rain showers pulsing through with wet snow falling to lower levels. The tops however were a completely different story, with winds reaching 50mph and blizzard conditions in the shower, with of course the showers falling either as snow or hail or both and a wind chill of minus -15ºc or more! With conditions forecast as such and knowing we were going to be spending time ascending and descending the summits of Skiddaw (possibly the windiest summit in the Lakes), Great Calva and Blencathra, with near zero degrees bogs to wade through we knew we would be getting cold, so the above clothing selection is pretty much what Charlie was wearing, plus he has a chest infection at the moment so he wanted to nurse that the best way he could whilst still heading out (our advice would be, don't head into the fells with a chest infection, better to nurse it at home... however....). The pack you wear is almost as important as your waterproof jacket, meaning it must fit well and serve the purpose you need it for. There are a plethora of running packs from race vests to mini-exped packs. For winter we advise between a 12L to 20L pack, depending on what you're doing. We use a 12 litre pack for short runs, like around the Helvellyn Edges from home, or for longer foray's out Charlie prefers a 20L pack, especially when he's guiding, as a 20L pack allows him to take all the extra's and safety kit he feels he might need. What he takes depends upon the weather, but below we'll list essentials and then 'nice to have's', that will become essential if the weather is particularly foul. The packs we most like at the moment are Ultimate Direction, although we do also favour Montane and OMM as well. Bivvy bag - Adventure Medical's Kit do a great Spring, Summer and Autumn bivvy, but in the Winter months we only ever take a Blizzard Survival Bag, unless its just a quick mission and then the AMK bivvy works well. What we like about the Blizzard Bag's is that they add around an 8 TOG rating to the bivvy's they produce meaning you have more time to survive whilst the MRT's are on their way to you. Compass - make sure its a good one, as we don't trust cheap compasses in cold weather. All compasses with get a small bubble that will increase in size with the cold weather and as you climb higher up the fells the bubble will increase. Generally this isn't a problem, but the bubble should go as you descend. Map - take a map to use, plus have a spare in your pack. Very easy to get the map ripped out of your hands in high winds and if you lose a map in sub-zero temps you could be in very big trouble. We advise the Havey's/BMC Map for the mountainous regions of the UK, but a 1:50'000 map in Scotland when snow is on the ground is perfect for navigation, much better than the over cluttered OS 1:25'000. GPS - take a GPS or have either mapping software or OS Locate downloaded to your smart phone. Invaluable when you find yourself miss placed as you will be able to relocate yourself very quickly should this happen. First Aid Kit - can be minimal but make sure you have something to plug large bleeds, just incase the worst should happen and you snap a limb... serious situation, but it does happen, all too easily, especially when the ground is very slippy. Primaloft spare layer - Very essential to take a spare warm layer for when you stop or if you get injured and need to get extra layers on. Take as light as possible, with a hood is a great idea. Goggles or glasses for wind and snow. Flask with something hot like Tea, Coffee or Soup - remember, its all weight on your back! Carrying water can be a problem during the winter months. Remember as well, each 1ml of water weighs 1 gram, so 1 litre of water is 1KG! There are several methods, all tried and tested. Carry a bottle/soft bottle with a small supply from 300ml to 500ml is the usual size. This can freeze on the outside of your pack, depending on how you carry the water. Carry your water in a Bladder, this will keep the water close to your core temperature and stop it freezing, but remember you will need a neoprene tube to insulate the bladder feeder tube. Carry an empty bottle or plastic cup and fill up/drink at streams, becks and rivers. Carry an empty bottle and use a water filter to fill up at streams and rivers. Remember if its a 'Sawyer' water filter then make sure you don't let it freeze, as this will damage the filter irrevocably and the water will no longer be filtered. Heading into the Snow Line? You will likely need some extra bits of kit, but its also essential how to use them. Ice Axe/Walking Axe - Having an ice axe is great, but remember its also essential how to use it. We can all manage to use the axe to gain height, hooking it into frozen turf and ice, maybe hooking it round a spiked rock.... but its still a skill, one might take to it well, another might struggle. However, it is essential to be taught how to use your ice axe to break in case of a slip or fall. This is the main essential skill you really need to know about your axe. This is the skill that could literally save your life! We recommend a really lightweight aluminium ski mountaineering racing axe for running, but there are plenty of other very light walking axes on the market. A 50cm shaft will be fine for most, as remember you are trying to move as light as possible through the fells and if you combine the weight of a proper winter pack, then you will realise its essential to get the lightest in all of the above. 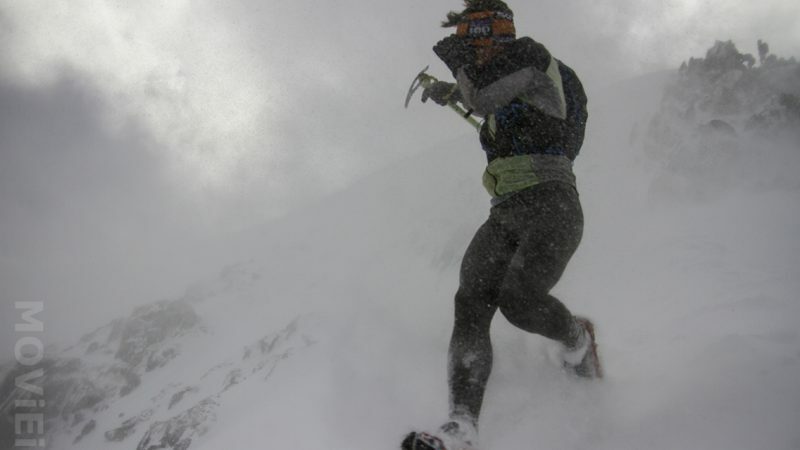 Crampons, Spikes and Winter Shoes - Essential for hitting the snow-line. Many runners head into the hills without spikes and fair fine, but then the day you need them and don't have them, well thats a silly error. Better to carry them and not need them, than not carry them and find you really need them. If you run in a pair of Inov8 Oroc's or something similar then you don't necessarily need spikes, although I prefer the use of spikes as they give great traction to all footwear, whether its a pair of trail shoes, running sandals or lightweight walking boots. They are extremely versatile. We favour Kahtoola Microspikes for use on hard pack snow, ice and mixed ground like Striding Edge, when the snow is minimal or at least a dusting. They are perfect for running in the Lake District, but do have their limitations. Kahtoola KTS Steels are the next step up and sit between a 'Microspike' and a full winter boot and crampon. KTS Steels allow you to run well in deep and drifted snow, whilst still working excellently on hard pack snow and can perform well on ice, but Microspikes work better when the snow is harder. KTS Steels will take you into terrain where the terrain moves from running into mountaineering and its more than possible to climb up to Grade III ice, if the route is chosen carefully and the runner/climber possesses the skill set to do so. Inov8 Oroc's, Ice Bug shoes and other 'dobbed' or spiked shoes will replace the idea of running with Microspikes on, they are a great addition to winter running, but in my mind not a full replacement for microspikes, I guess it depends on the terrain you run on. 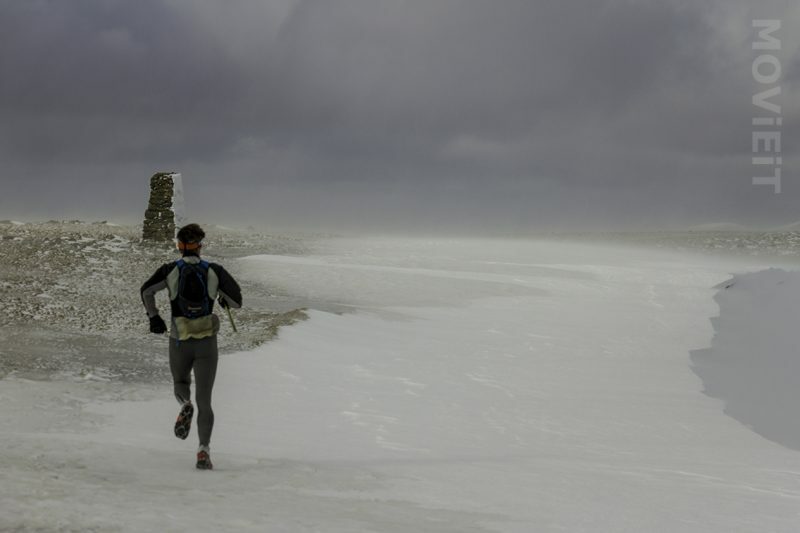 Need to know more about essential winter skills for running?